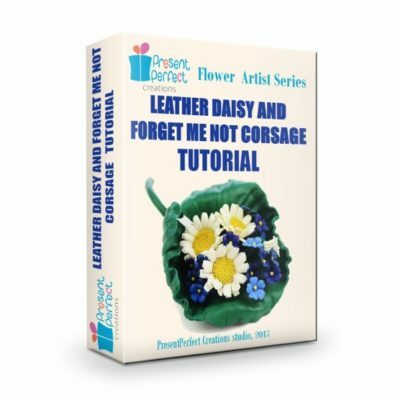 View basket “Leather Daisy and Forget me not corsage tutorial” has been added to your basket. 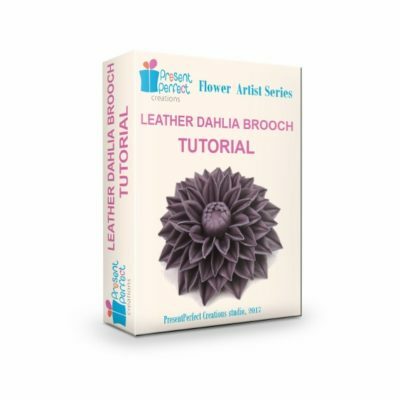 New leather flower tutorial is out! 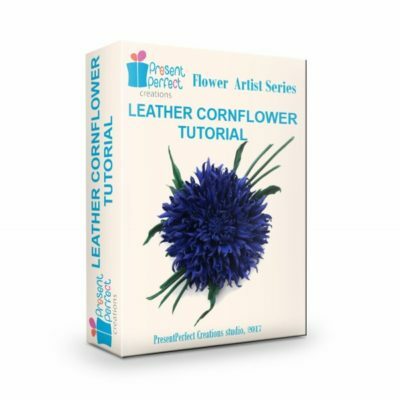 LEATHER GERBERA TUTORIAL IS AVAILABLE FOR DOWNLOAD NOW. 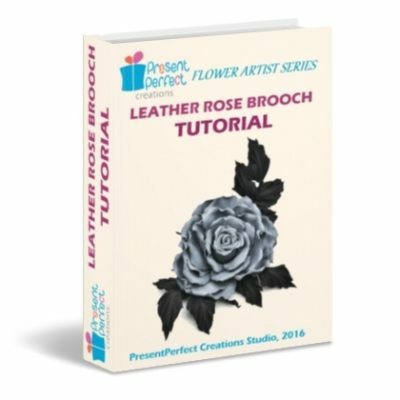 As promised yesterday I am sharing a link to the new leather flower tutorial. 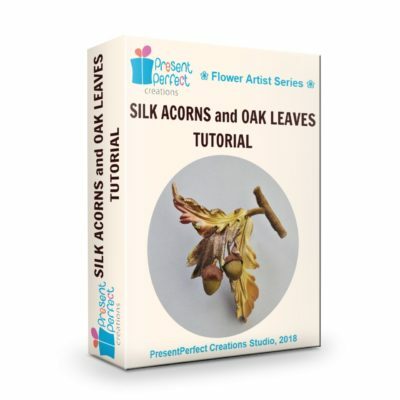 This new tutorial is more than any previous ones full packed of pictures showing every step of the process, but should you have any questions or would like me to comment of the flower you have created using this tutorial I am here to help. 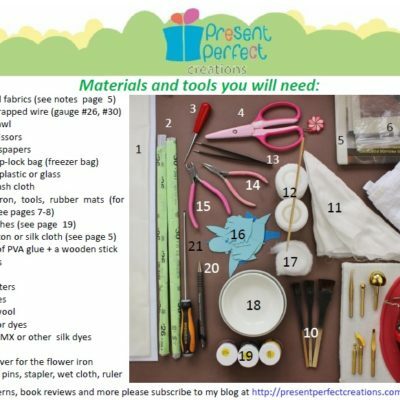 You can always e-mail me at enquiries@presentperfectcreations.com. 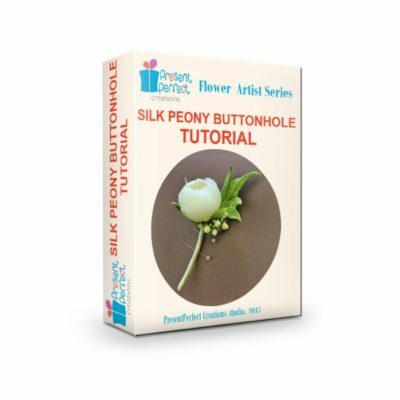 I would also like to hear if there are any particular flower tutorials you would be interested in. 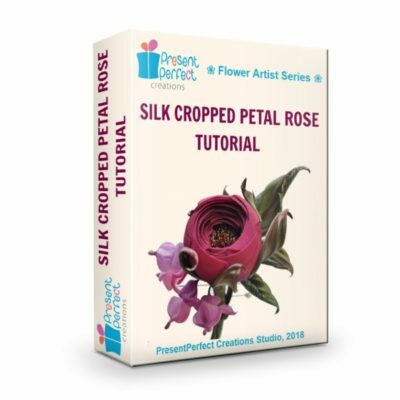 There are so many beautiful blooms in this world and they are all so different that it is virtually impossible to create all of them. 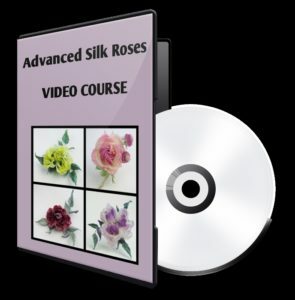 But such all time favourites like roses and poppies are already on my list of tutorials to do. Ah, and the last thing (but not the least)! 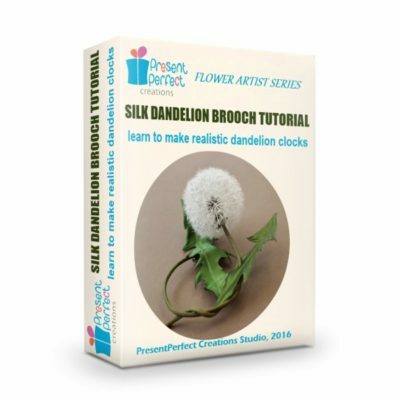 To purchase your copy of tutorial with a 30% discount simply use gerbera30 discount code on checkout. 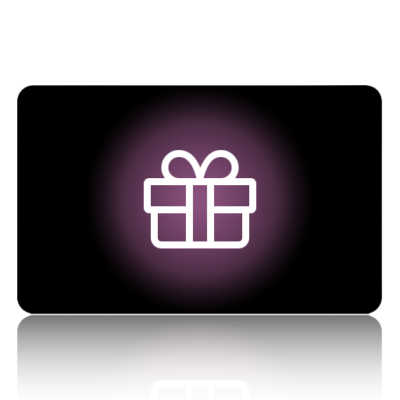 But do remember that this is a time sensitive offer and it is valid only until midnight Sunday 14 December 2014 GMT. 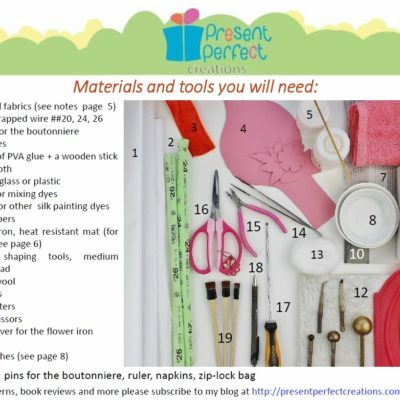 Here are the tools and materials that are required for this tutorial. 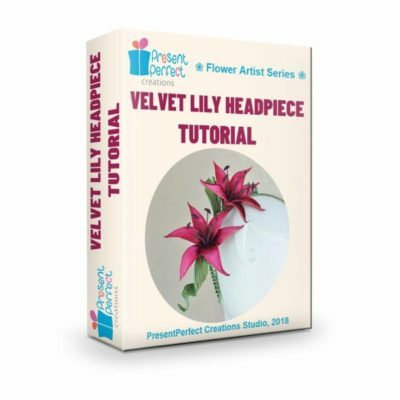 This is a choice of flower iron tips you can use in this tutorial. You will require JUST ONE of these, any that you have in your set. I am using the far left wide foot with 3 grooves. And finally, some pleasant news for you as subscribers of my blog. 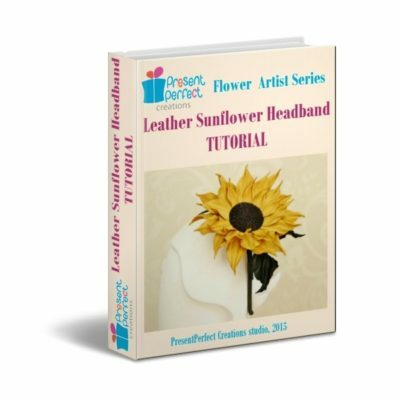 I am going to offer you a special introductory price on this tutorial till the end of this week (midnight on Sunday) so you will have a chance to make your own leather gerbera and pay 30% less for the tutorial. 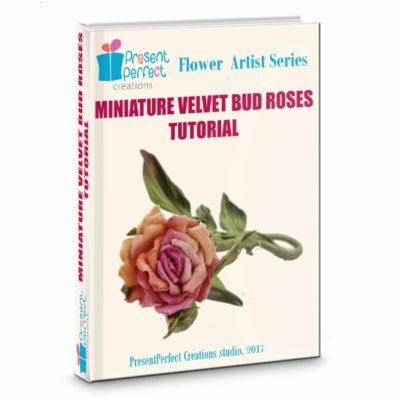 Tomorrow I will send you a link for the tutorial at my online shop as well as a discount promo code for it. I hope that you are as excited as I am waiting for the release. 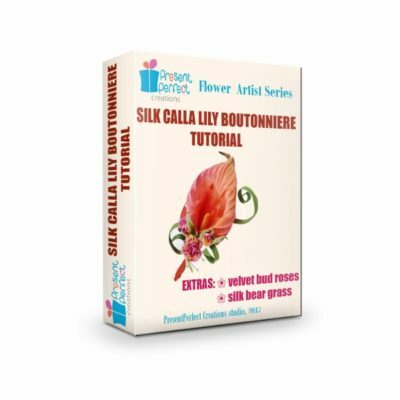 I have a lot of other ideas on tutorials on silk and leather flowers but your comments and preferences will be much appreciated, so if you want to ask or suggest something please do so by leaving a comment for me below. 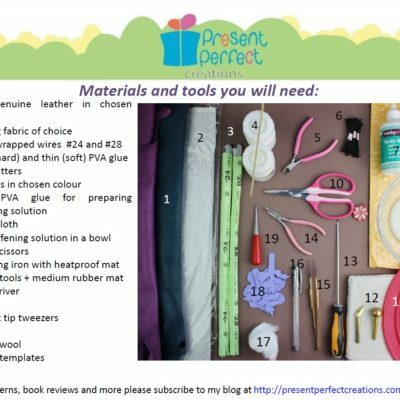 Stiffening leather and getting ready! 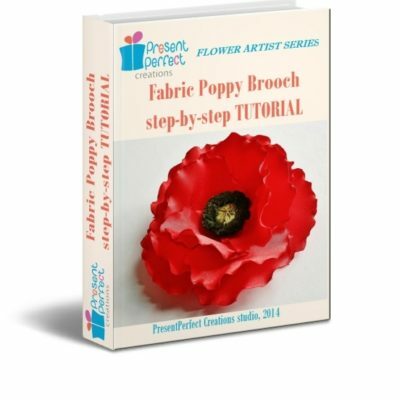 Hours are left before the release of the tutorial and I can not keep it a secret any longer! 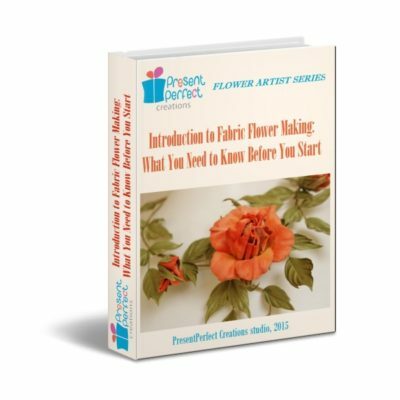 Yes, the tutorial is on creating a leather gerbera flower just like one in the picture to the left. 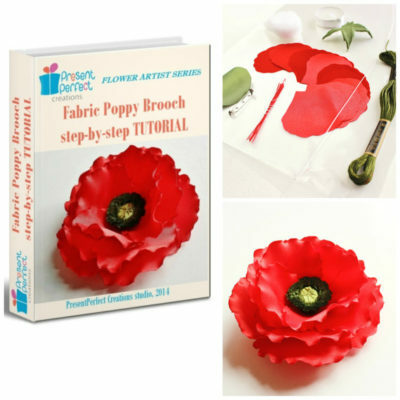 It is easy enough even for a beginner to try and at the same time those of you who can not wait to use their flower irons can have a go at them when making this flower. 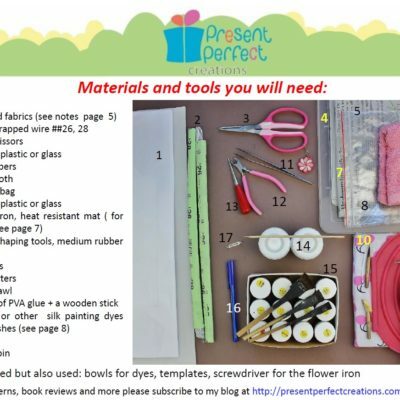 Although the tutorial shows how to finish the gerbera with a brooch pin, it can be turned into a range of other accessories just like any other flower. In fact, I take pride in my ability to come up with quite unusual and quirky floral accessories. 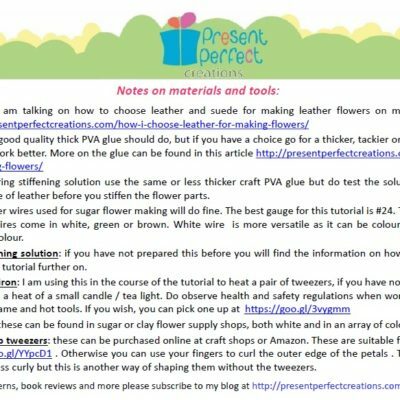 To share one idea with you I can say that a pair of leather gerberas can make stunning shoe clips which you can jazz up your favourite pair of shoes with. 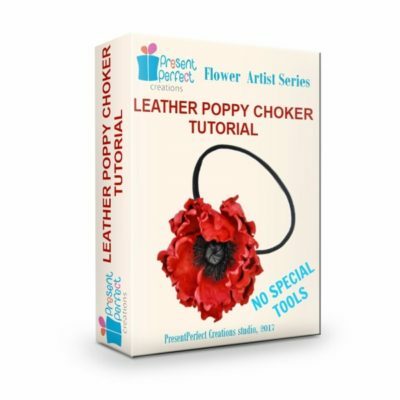 It goes without saying that leather gerbera brooch makes an original and much appreciated gift for those who understand about hand crafted accessories. 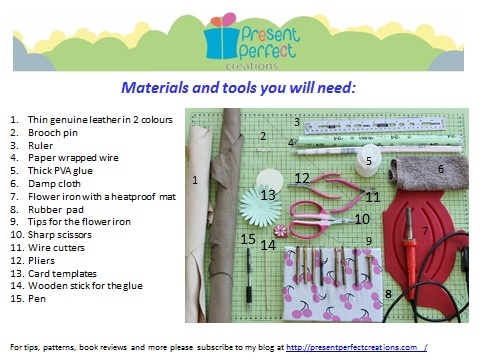 Provided you have got some suitable leather and a bit of time you can still make one or two flowers before Christmas! To use time efficiently you can stiffen you leather in advance. 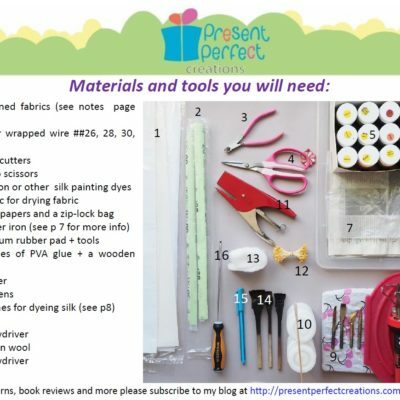 I am explaining how to do in in my blog post here. 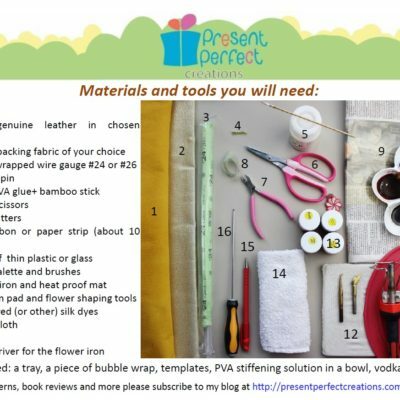 It is better to use 2 contrasting colours, say, a darker leather for the centre and some pale (or rich!) 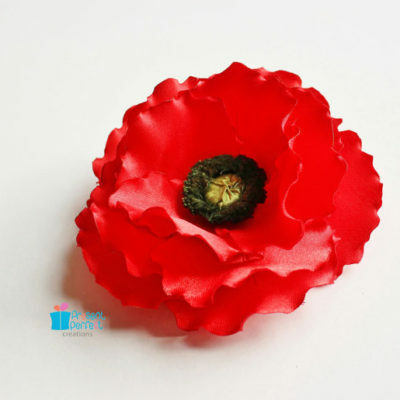 coloured leather or suede for the petals. 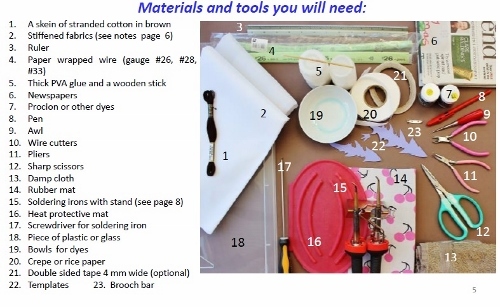 Here is the list of materials and tools you will need for the tutorial. If you have any questions regarding this list please feel free to leave a comment below. And finally, some pleasant news for you as subscribers of my blog. 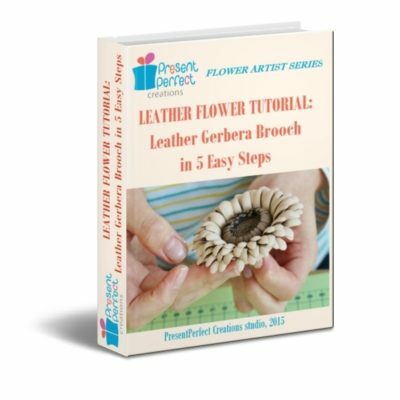 I am going to offer you a special introductory price on this tutorial till the end of this week (midnight on Sunday) so instead of full price you will have a chance to make your own leather gerbera with a 30% discount. 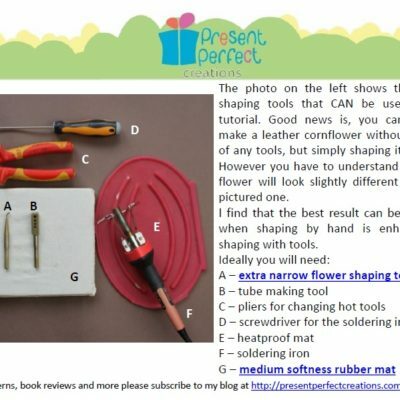 Now that we have chosen thin and soft leather for creating leather flowers it is time to talk about the right tools which are going to help us turn a flat piece of skin into a 3D floral masterpiece. Tool number one is (believe me or not) our hands. 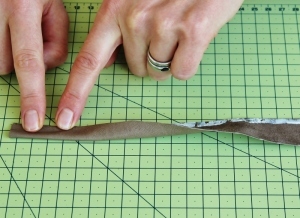 A lot of shaping can be done with just hands. In fact, some flowers are made without any special tools. 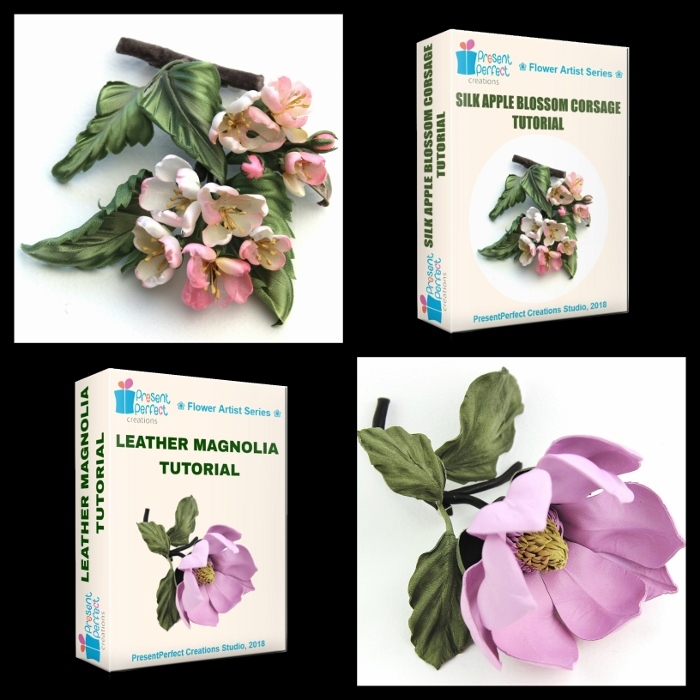 Different ways of folding, twisting, stretching and rolling leather give a wide range of special effects that allow us to create beautiful leather flowers. 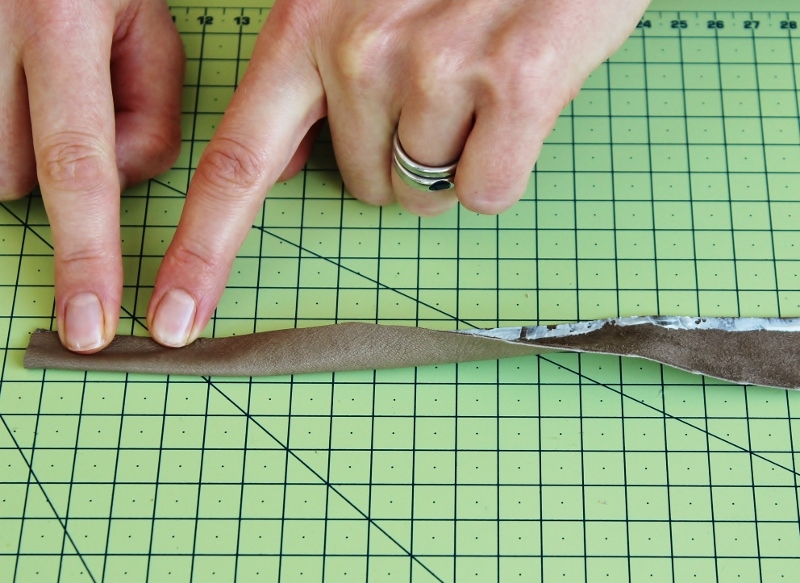 Tool number two is a floral iron with interchangeable tips used for shaping fabric flowers. 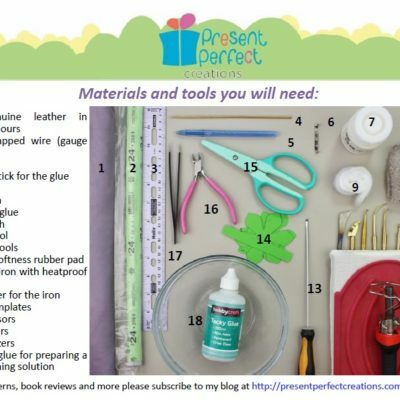 This tool can be used to almost the same extent with leather but bear in mind that leather can not withstand high temperatures. 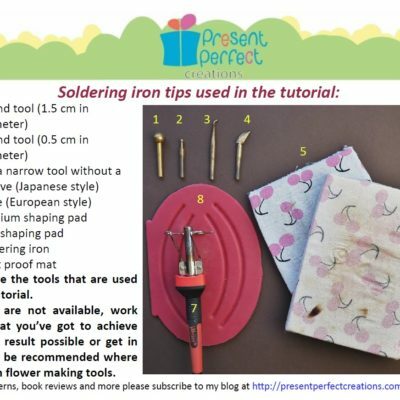 It can burn and shrink if the flower iron is too hot for it, so I recommend to always check the temperature of your iron on an off-cut before touching a petal or a leaf. 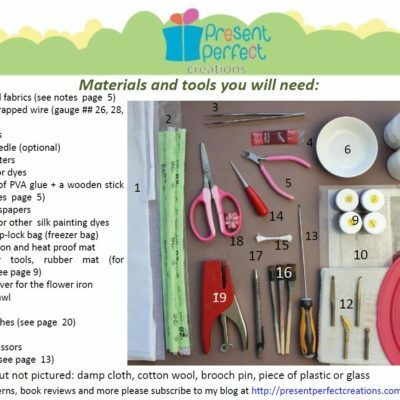 I wrote about my set of tools in this post here, so if you have not seen it you might want to read it now. 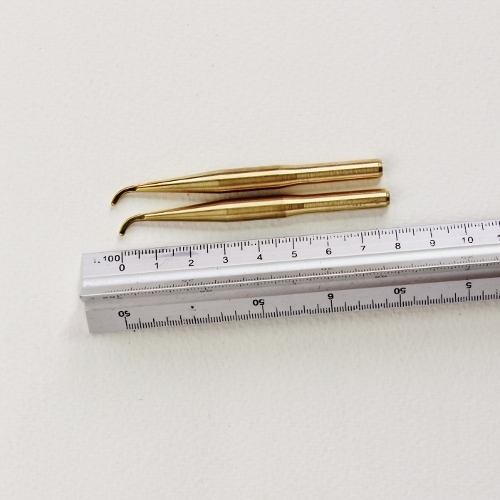 The third tool I would like to mention is a pair of tweezers like these ones in the picture. 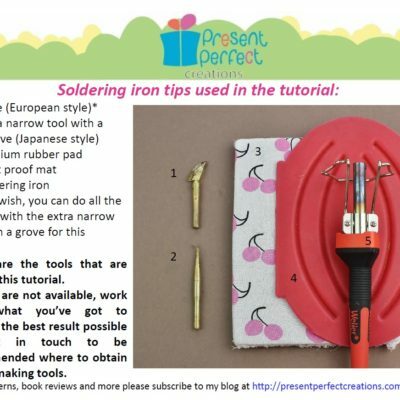 Tweezers are heated in the body of the flower iron and used for curling petals for roses, poppies and other flowers. 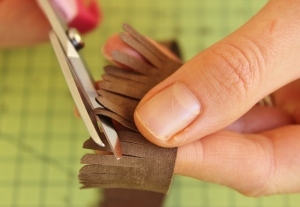 Leather petals might be quite stiff to the touch but the shape you are giving them will make them look light, airy, breathable and ever so live! 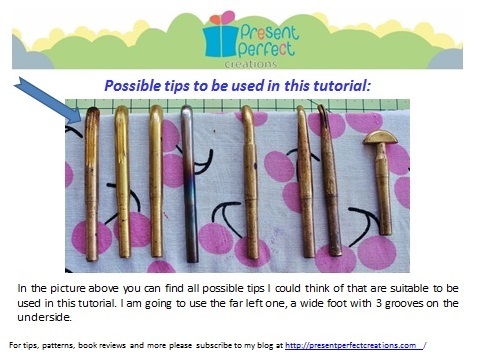 I highly recommend to get yourselves a pair of tweezers like those. Humble as they look the role they play is very important and the results will impress you. 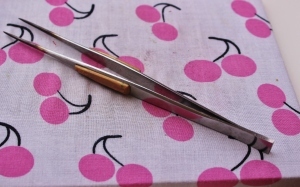 A PAIR OF SUITABLE TWEEZERS FOR SHAPING FLOWER PETALS CAN BE PURCHASED HERE. ❀ leather and suede flowers nicely complement winter wardrobe pieces made of thick warm fabrics and wool, accentuate hats, bags and boots. 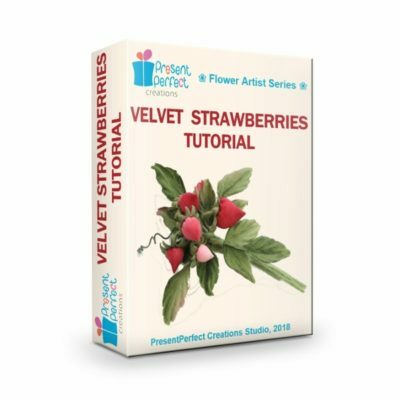 At the moment I am working on a new tutorial which will be released later this week. 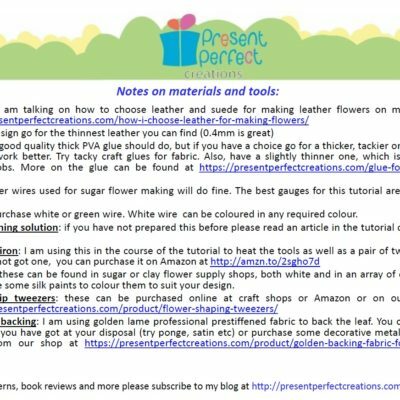 As the tutorial is on a leather flower, I thought I’d share some useful tips on how I choose leather for making flowers. 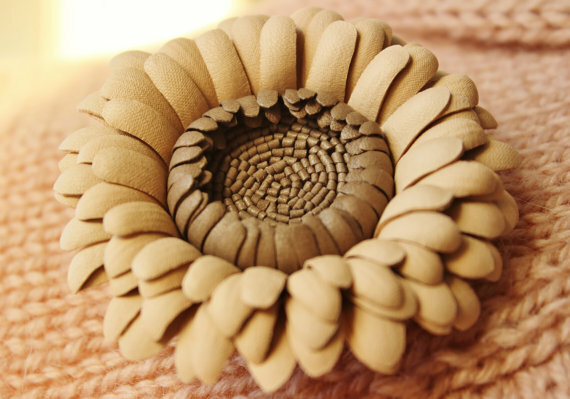 In order to create leather blooms we use only genuine leather or suede. 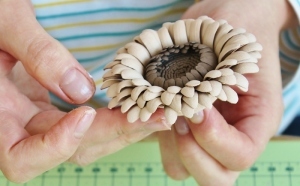 No synthetic substitutes can withstand the heat of a flower iron when flowers are being shaped. 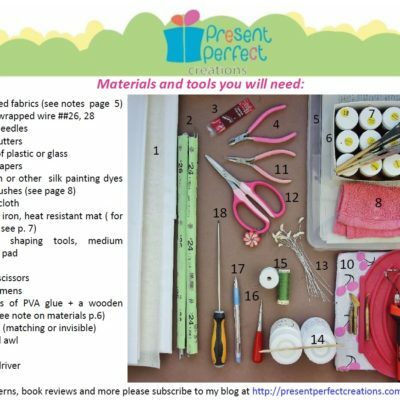 It is best to work with decent quality materials. 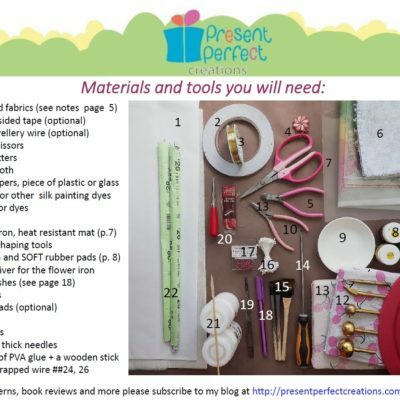 This way you will enjoy the process of creation and the final piece will show class. Leather comes in grades. There are 3 primary grades, the smaller the number the higher the quality. 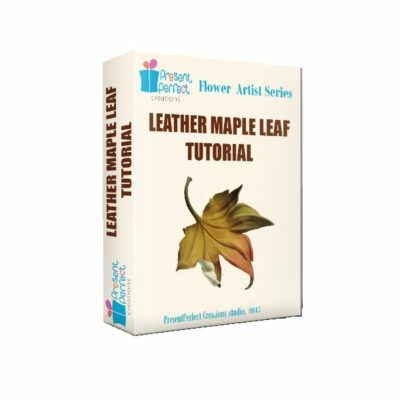 Because petals and leaves are relatively small compared to, say, garment parts, we do not have to use Grade 1 leather skins, Grade 2 will do just as fine. 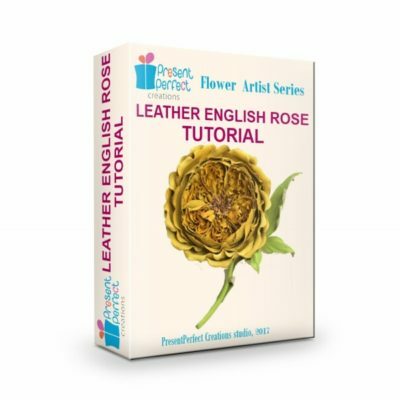 For leather or suede flowers only thin and soft skins are recommended. The best thickness is 0.5-0.8 mm, but you can use skins up to 1 mm thick. 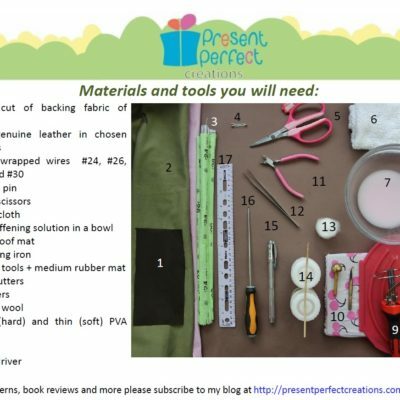 Ideally look for goat and lambskins that are suitable foe clothing or glove making (gloving leather). Sometimes I use pig suede. 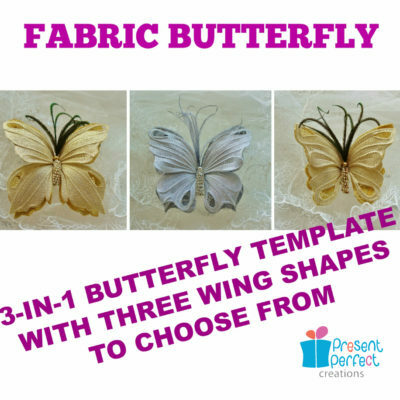 Although it is a bit on a thicker side and can be uneven, the wide range of rich colours it comes in makes it difficult to resist. Leather and suede have different finishes. 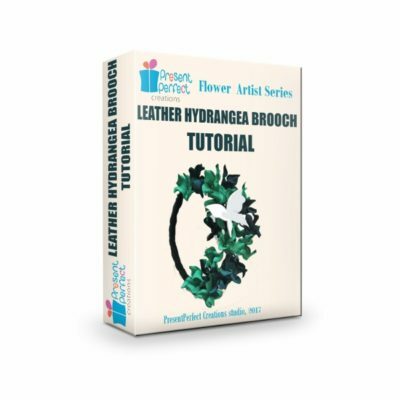 This variety of finishes is used to enhance the natural beauty of leather. 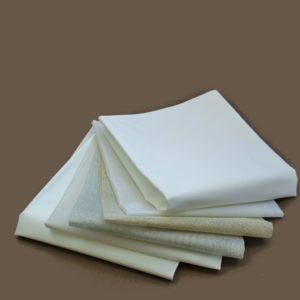 The most common ones are aniline, pigmented, patent, metallic, oily, waxy, suede and nubuck. 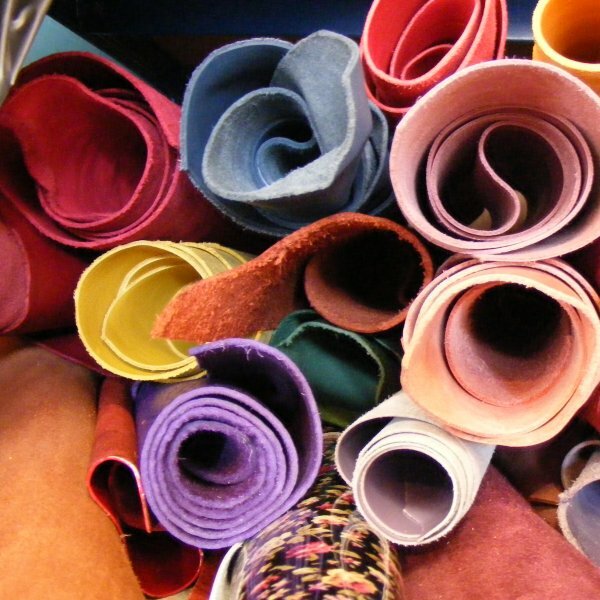 Leathers with different finishes will behave differently when stiffened and shaped to be turned into a flower piece. 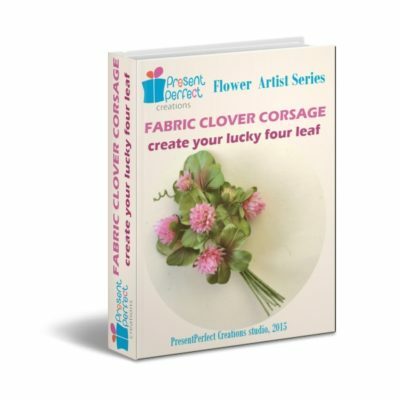 Unlike silk leather is much less predictable. That is why it is virtually impossible to recreate a leather flower again. It will be different and for me that is the advantage of working with leather. 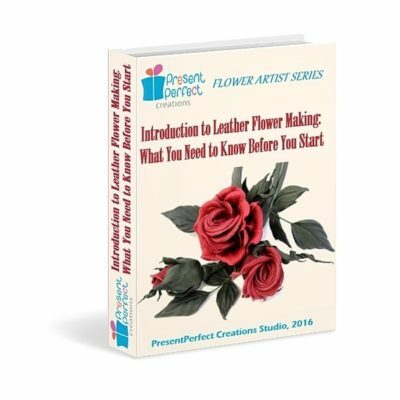 Creating leather flowers is always a journey into the unknown. No need to worry, the outcome is always uniquely beautiful. 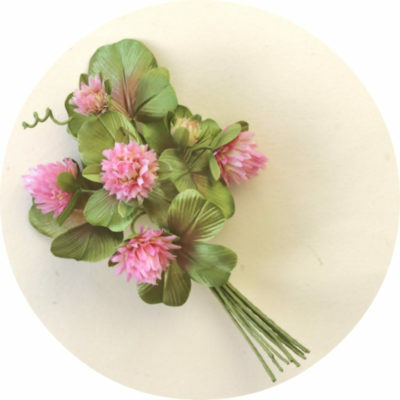 We also offer individual workshops on leather flowers, so if you are interested please click through for more information. 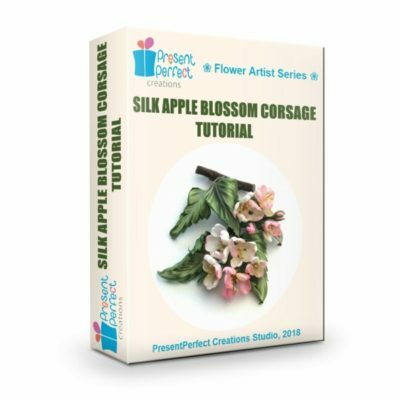 As I have mentioned before the techniques similar to the ones I use for silk flowers can be used for genuine leather and suede in order to make floral accessories. 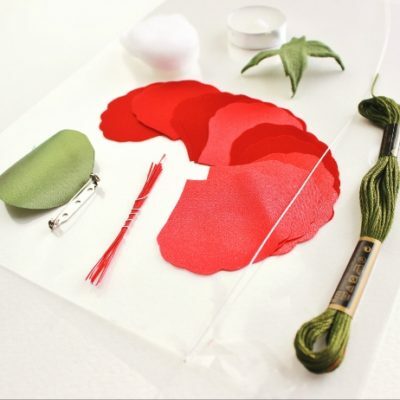 Although there are some specifics when working with leather I use the same set of tools to shape leather petals and leaves. 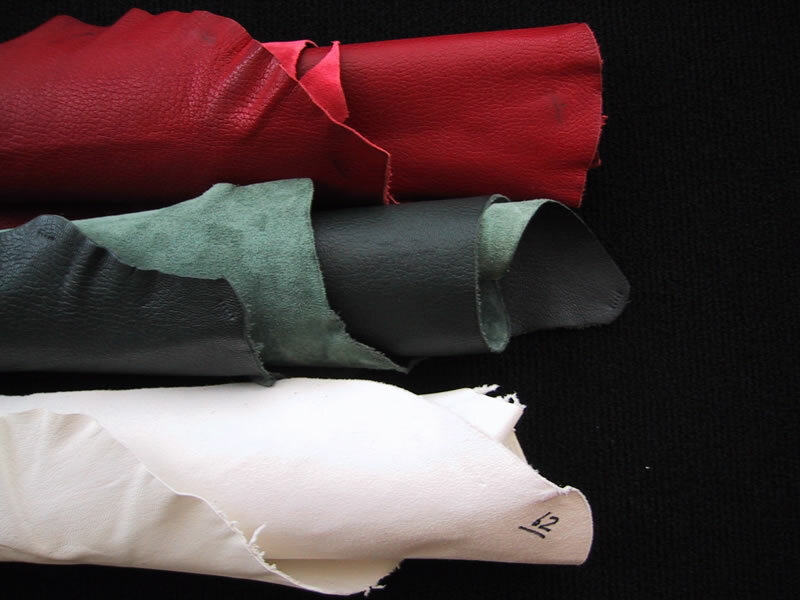 I must say that leather being such a rich and luxurious material requires less work done to it to make an accessory when compared to using silk. In my experiments I have tried both leather and suede and as any natural material they proved to be great to work with. 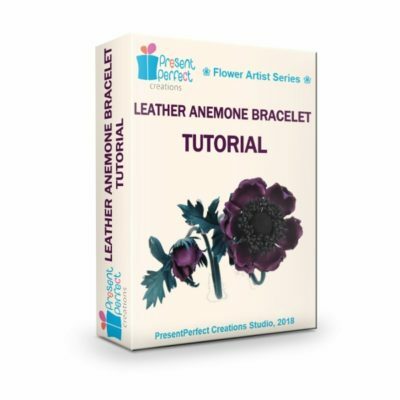 I would like to share several of my latest leather accessories with you. This fantasy cornflower brooch is made of intense blue leather and decorated with faceted glass beads. The fantasy camellia in rich berry colour is made of both suede (the petals) and leather (the leaves). It is finished with a brooch base. The corsage is available from my Etsy shop. 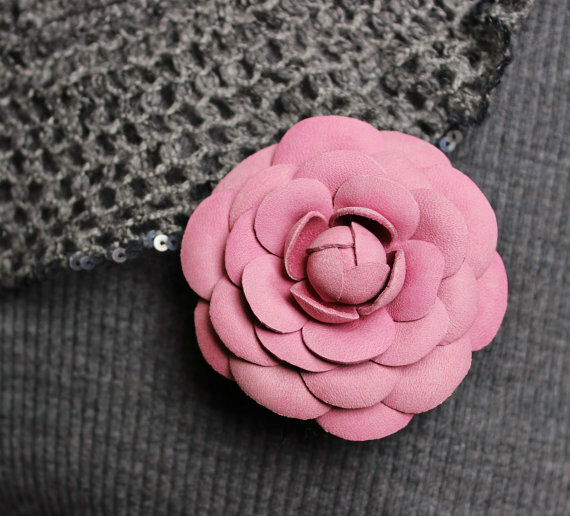 Not only great for a jacket or coat lapel this handmade fantasy camellia brooch is perfect to decorate your belt, handbag or hat. 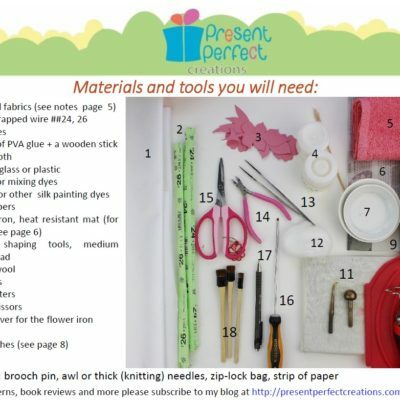 It makes a great gift too, especially for the forthcoming Mother’s Day. 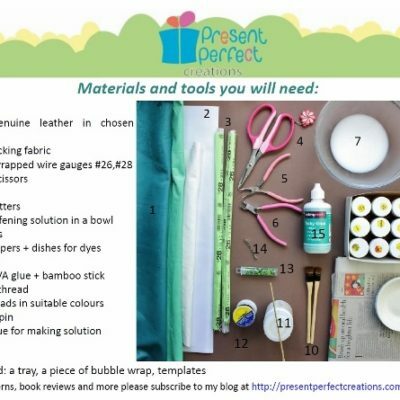 Alternatively it can decorate your jacket, belt or a handbag. 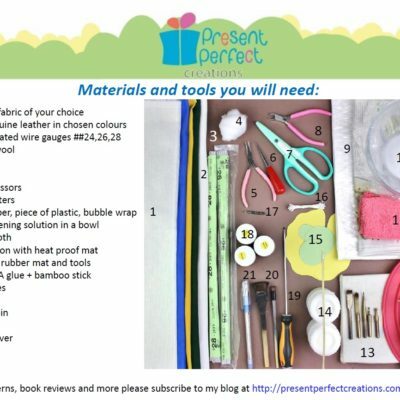 And again you can consider it a nice gift to your Mum or a friend. 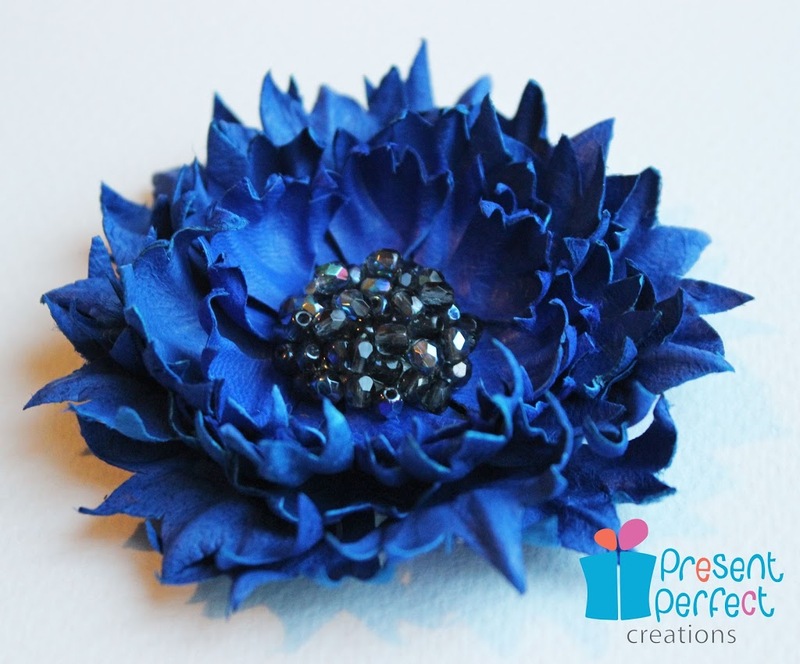 This fantasy aster brooch is available here. I would be pleased to hear your comments on these leather accessories or ideas of how to incorporate them into our outfits this coming season. 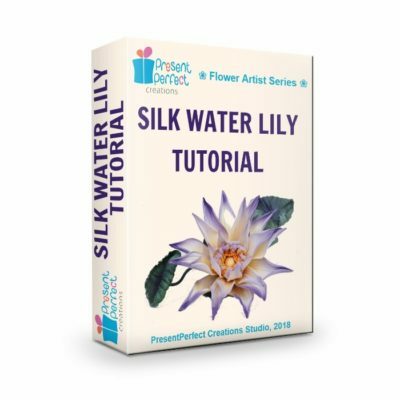 Detailed step-by-step flower tutorial for makers who wish to to create a seasonal fabric accessory in a couple of hours. 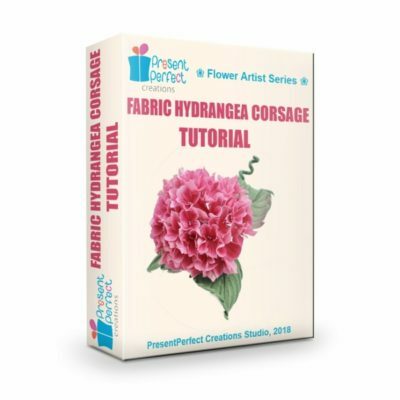 Detailed step-by-step flower tutorial for flower artists who wish to learn the secrets of delicate and charming fabric hydrangea flowers. 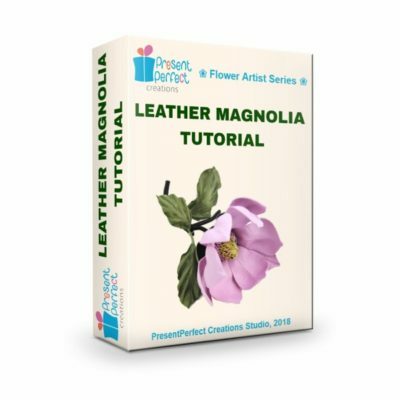 Detailed step-by-step flower tutorial on one of the most impressive spring flowers, the magnolia.